I’ve gotta be honest- I live for organizing closets. Changing season from winter to spring is especially giddy-inducing because it means swapping my darker colored pieces for more brights, and airy dresses. I understand that this experience isn’t a joy for everyone, so I’m sharing some of my tried and true tips for organizing a closet that is neat, inspiring, and aesthetically pleasing. 1. Start with what you always use. Pull out pieces that you wear mostly year round (for me this is long and short sleeved tees, along with some tank tops for layering). 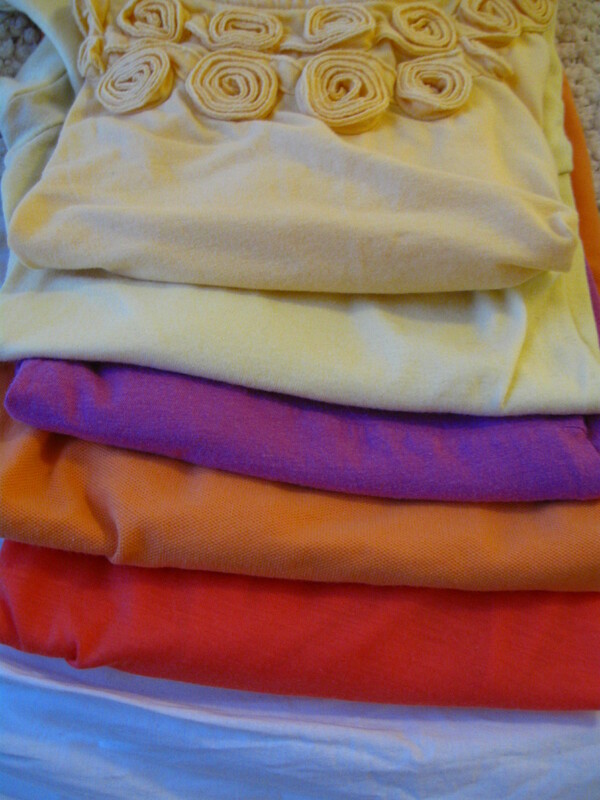 Cotton fabrics are fine folded if you don’t have room to hang them. 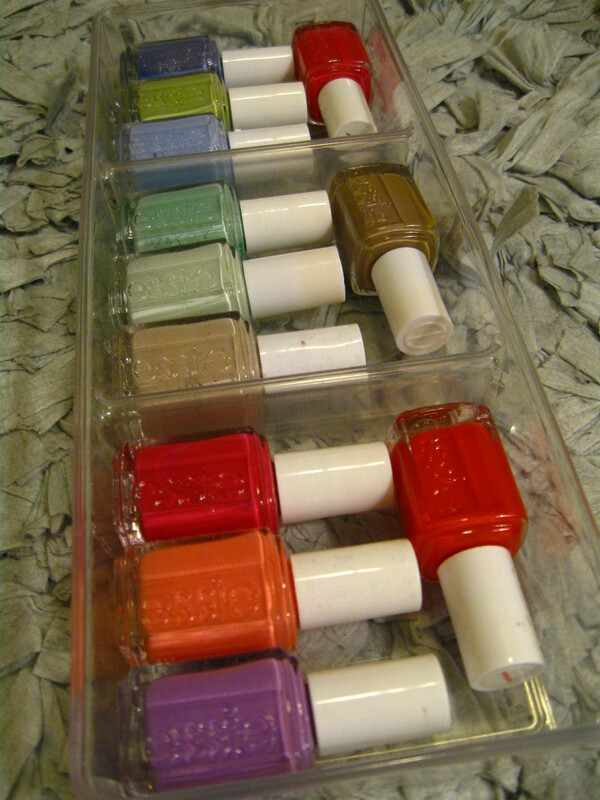 I like to organize mine in color families from dark to light. Store them somewhere easy to get to and pull out in a hurry (Monday morning anyone?). Also, don’t let your folded stacks get too high or they’ll get messy and may collapse on one another. 2. 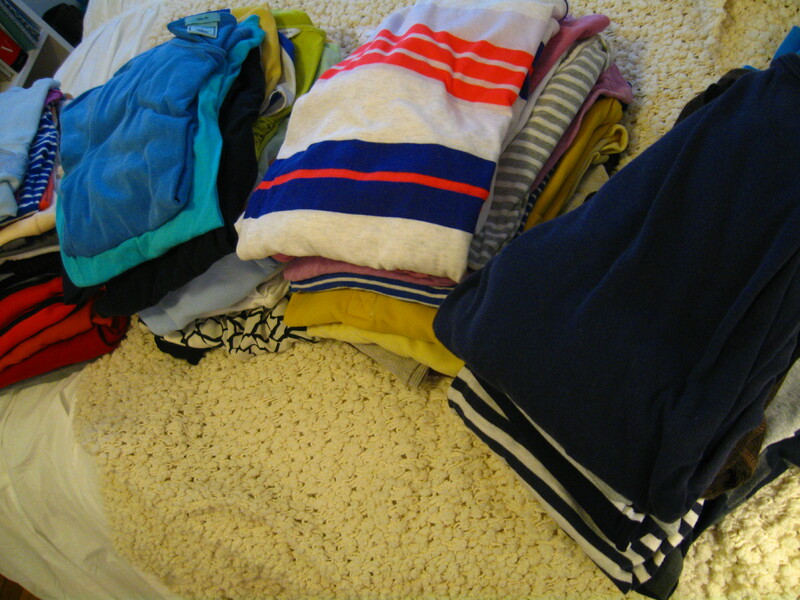 Say ‘Bye Bye’ – Put away clothes that are out of season – I store mine in under the bed boxes. 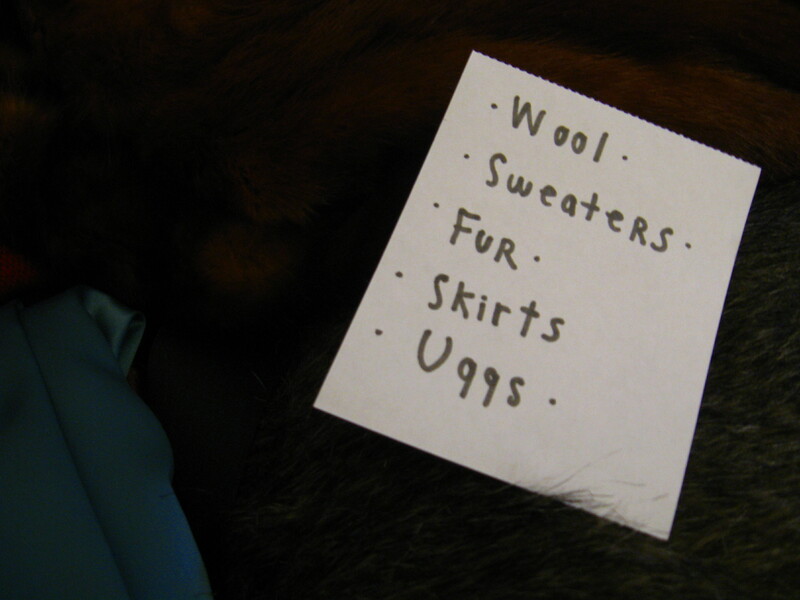 Use labels to record what pieces are in each box in case the weather changes (vacation, for example), or you need things in a pinch. Also be honest with pieces that you barely wore all season, and put these aside for a clothing donation site in your area. 3. Make friends with your closet – Despite the fact that my closets have no overhead lighting, and are quite narrow, I make them work. 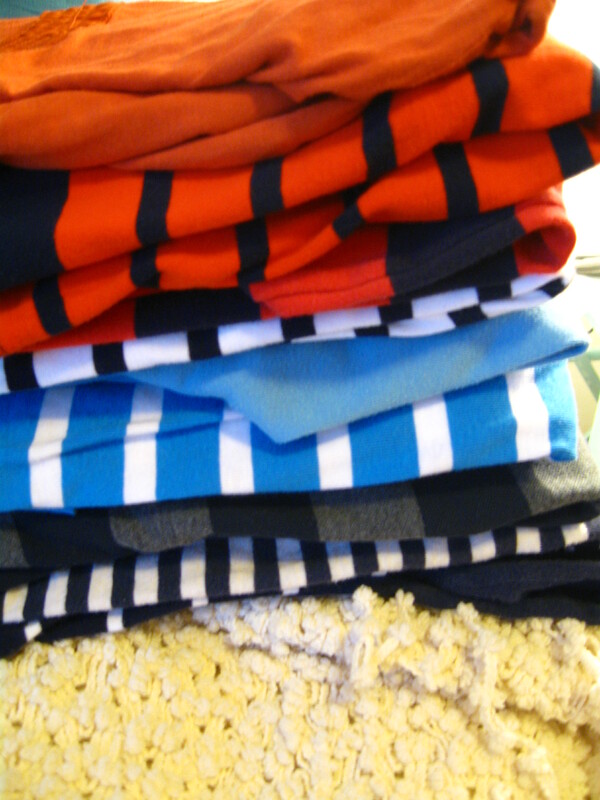 I organize by tank tops, short sleeves, long sleeves, and then jackets (left to right). I try to hang things that wrinkle easily (linens, silks) or that get lost easily in the folded piles below. 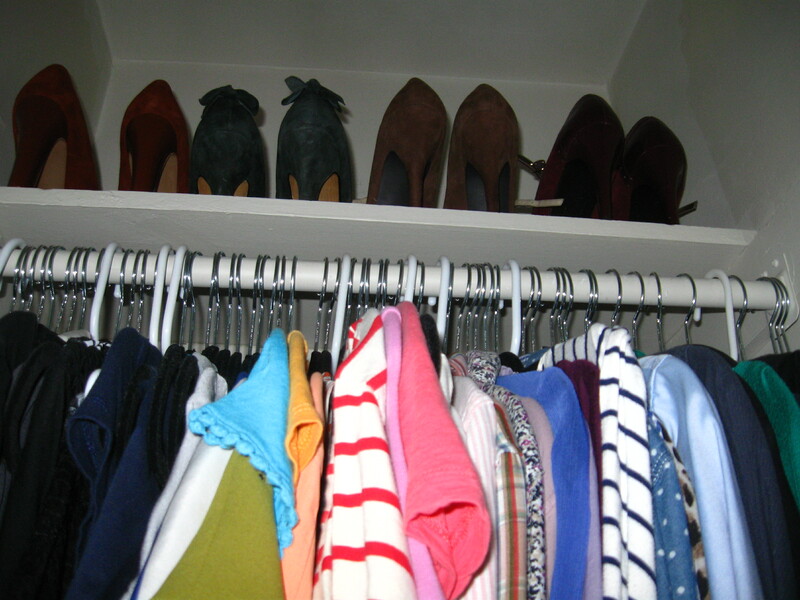 I also color coordinate in terms of each section of my closet (tanks, short sleeves, blouses, jackets), but find a system that helps you find things easily, and see the dominant colors you own – this is also a great way to see what colors your are drawn too, and have an ample, or meager selection of. I hope these tips help each of you find a system that works for your closet space, style, and type of pieces. I’d love to hear if you are trying a new approach this season! Also, hope you enjoy the new layout – working out a few kinks with templates, etc!